We went on a trip to see my family this weekend. That is a 5 hour drive each way. I was going to work on the books I mentioned last week, but hubby had a better idea. I bought him Max Lucado’s book Outlive Your Life:You Were Made to Make a Difference for Christmas last year, and his CD player promptly died in his car. So he hasn’t listened to it yet. He suggested we listen to it on our drive. I actually was a little bummed, but whined internally. We started listening. It is fantastic. It uses examples from the New Testament Church to talk about how they followed God, how he used him and changed them to change the world. There are also a plethora of modern day examples of people using their skills, passions and hearts to impact hearts, people and nations. It also challenges us to take our lives and impact others, to fill a need where we find one, to stick with our calling. We got through 3 CDs, 1 to go. I am yearning to finish it. Now I have to decide whether to finish it on my own or wait for hubby. I am also thinking about all we heard. How can that change how I live my life? How can I help the hungry, the homeless, the needy? It made me think a lot about this post from Erica at Off My Mama Rocker. It made me think how she is living the truth of Outlive Your Life through her love for this man, raising her children and her work as a birth doula. That is how she impacts the world, how can I? I dream of getting involved with Lauren’s work for mama’s with postpartum depression. I’ve talked about her dream. I haven’t forgotten and my mind still goes over and over it. One thought that has come to me is, as I get better, getting involved at a local level in helping mamas with postpartum mood disorders. I envision a support group that involves meals. People open up over food. And what mama struggling with postpartum issues wouldn’t like to be pampered with someone else providing her dinner? I don’t mean a potluck, because mamas at that point in life don’t need another burden or task, they need someone to care for them. Food is a universal message of care, love and healing. But how well do I need to be before I take on a support group? What can I do in the meantime? How can I help those in need? How can I get my family involved? How can we bless people in the name of Jesus in a practical, real way? How? How do you brighten your part of world? What need do you have that someone else could help you fill? If, by any chance, you would like to get ahold of this book, it is available through Christian Book Distributors. On Pentecost, the Spirit came down and ignited the hearts and minds of believers to preach the gospel and live out justice for the forgotten. Max Lucado wonders, Might it happen again? Does God still free hearts, minds and bodies from the ravages of sin and poverty? The answer is yes! He does it through you, and in Outlive Your Life he challenges you to make a difference that will last beyond your time on earth. Take a stand for children, widows, and families who only need an opportunity to live. Unabridged. I love books. My family loves books. My husband says I have a library. He’s not far off. Then I had kids. I have been buying children’s books since before I met my husband and kept all of mine from growing up. I have done very little reading this week, but I did buy a new book, one on how to lower your cholesterol. I feel so old…but I found out this week that my LDL cholesterol is high…Ugh. I used to fly through books. One in a couple hours or, at the very least, in a weekend. I remember those days. I even indulged myself in one of those marathon weekends while we were camping this summer. I felt guilty. I buried my head in my book every chance I got. It was a murder mystery. Not at all uplifting but it was compelling enough to help me engage in something as I began a spiral back into the postpartum depression. That book might have been one of the few things to help keep me from a second hospitalization. Most of the time, books take me forever to get through now. Kids don’t really like to let you sit and read and not pay attention to them. And I’m too tired to read after they go to bed. My choices are read, blog or run. Right now the blogging or running get chosen most often. I’m not as grumpy about being interrupted when blogging as I am when interrupted by reading, and the mind clearing I get from running is priceless. But I digress. I have been slugging my way through One Thousand Gifts by Ann Voskamp. On the surface, it’s premise seems like a light read, but it is anything but. Ann walks the reader through her journey to see every day things worthy of praise and thanks, from the simple, the colors in a soap bubble, and the hard, the death of a child. As we run toward the moon in abandon, or we talk our child through the anger in their heart. As our thanks in all as worship and obedience to the Lord. Her book is worth the work it is to read, but don’t be lulled into thinking making a truly meaningful list of 1000 things to be thankful for is an easy read or task. Drawing heartbreaking beauty out of the simplest of details, Ann Voskamp invites you into her grace-bathed life of farming, parenting, and writing—and deeper still into your own life. Here you will discover a way of seeing that opens your eyes to ordinary amazing grace, a way of living that is fully alive, and a way of becoming present to God that brings you deep and lasting joy. Join me tomorrow as I continue my thankful list. 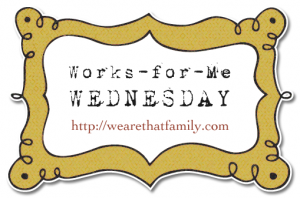 I am still loving blog hops and this week I am hopping back to We Are That Family for Works for Me Wednesday. What Works for Me this Wednesday? My 5? Friday post led into a bit of a discussion on holidays and how we as Christian parents “handle” them. I thought I knew, before I had kids, what I was going to do if I ever had children. I was NOT going to celebrate Halloween. No Santa Claus and no Easter Bunny. Here, I am 3 kids later, so how has that worked out for me? My kids go trick or treating. They want to know what Santa is bringing them. So far so good on the Easter bunny though we do hunt for eggs. We just don’t refer to how they got there. Why may you ask have I gone back on everything? Partly because I can not control every influence over my kids. They have friends who celebrate all of those things. They watch TV where all of those things come up and even books they see cover these topics as well. So instead of banning things, we choose items within them that need addressed. For example, we do not watch shows with witches at Halloween nor do the girls dress up as witches. And this year we figured out a very basic, understandable explanation for them. We don’t watch or celebrate witches because witches don’t love Jesus. As for Santa Claus, we consider him something fun at Christmas time, but not the focus. As I commented in my post on Friday, we have found a cute board book to help us explain Saint Nicholas was a real person, but Jesus is who we celebrate at Christmas. I included a link to the book on Christianbooks.com for those who might find this resource useful. I found a similar book for my girls called What is Easter by Michelle Medlock Adams. It talks in simple kid language about all of the things we see at Easter, the bunny, the pretty clothes, and gives them their place, but focusses on Jesus as the real reason. This one is not currently available on Christianbook.com, but many amazing resources are. In case I have you thinking about Spring, here is a place to search for items you might find useful. In looking for the Easter Books, I found a couple I might have to get my hands on for Thanksgiving. But that is what Works for Me this Wednesday. Hop, pun intended, on over to We Are That Family to see what works for others this Wednesday. Really, you have got to see her WFMW post. You will thank me. What do you think of boycotts? Do you think it matters to companies if you don’t buy their products? I do. I remember learning in high school economics class that each dollar I spend it a vote. A vote that I can give to one company or another, it is solely at my discretion. And that is before e-mail, social networking and blogging became such a big part of our everyday culture. Yesterday, via Twitter, I heard about a grassroots effort to get Amazon.com to remove an offensive book for pedophiles from their website and sales. Within a few minutes of originally hearing about the book and the proposed boycott, I saw probably 10 more “tweets” about it, including information on how to contact the CEO by snail mail and e-mail to let him know what I thought of Amazon.com selling books “for” pedophiles. And believe me, I sent an e-mail right away. It seems almost daily I receive an e-mail from a group asking me to boycott a particular company for what they do support or have refused to support. Some of them I agree with wholeheartedly, others I decide to, for lack of a better word, ignore. Others I have not let pass are when companies tell their employees not to say Merry Christmas or refer to Christmas Trees as Holiday Trees. I mean, come on, that is just ridiculous. I know from, not only that long ago economics class, but also from my job, that what we do and say with our money speaks to companies. And this is one area too where what I say matters. People hear your complaints about a company much more loudly than your compliments, though, they do hear both. So let your voice be heard, write those letters, e-mails and tweets; and make sure you cast your economic vote. Let a company know you will not support what they are doing by writing, then follow through by spending elsewhere until you see a change. You may not be able to change the “whole” world, but you can influence your corner of it! So, have I mentioned I have three little girls? In case I have not, let me say it again. I am the proud mama of three little girls. Most of my reading is limited to the directions on how to put together a new toy or a book at bedtime. But today I am going to try and tackle reading a book. I want to read The Birth Order Book by Dr. Kevin Leman. I actually read it several years ago while my hubby and I were dating. It was very interesting. It described me, as an only child, very well. And it described my hubby, who is the youngest, quite well. As Dr. Leman notes in his book, if there are several years between siblings, a child can end up with characteristics for their number in the birth order and sometimes so things that seem like an only or first born child. It was amazing to see how my hubby, who falls in that category, fit exactly what Dr. Lehman said. And all of this information is from my memory of reading this book 6+ years ago. So got to the library…only one meltdown by Sue…okay, only one in the library, we won’t count the ones in the car…those will be our little secret. But we got lots of books. And I got an older copy of The Birth Order Book. Now to read a bit at a time. This updated edition of The Birth Order Book, a classic bestseller, offers key insights into how birth order affects personality, marriage and relationships, parenting style, career choice, and children. Paperback. Whether you’re the firstborn, a middle child, or the baby of the family, your place in line can influence who you are and what you do! Explore the effects of birth order on personality development, marriage, parenting style, and career. Dr. Leman’s bestseller will help you recognize, understand, and overcome negative tendencies shaped by family environment. So I was thinking maybe people were tired of my blog, but today I got a topic “request” (thanks Jessica!). But this time the girls are 3 1/2 and 2, so it seemed like we should tell them; I had thought we would wait longer so it didn’t seem so far away to them, but people were starting to ask them if they were excited for the baby, and frankly, I was getting excited about telling Caitlyn, so we decided after the ultrasound to break the news. I got a book from Borders that I remembered reading as a child, The Berenstain Bears’ New Baby. (Did you know that was published in 1974!) Saturday night, for our night-night book I got that out and daddy got the video camera. First we read the story, then we talked about new babies. I asked them if they would like a new baby (glad the answer was yes), Caitlyn declared “everyone would enjoy it, but there is no bed for it.” So we talked about the baby could sleep in the cradle Sue used to sleep in (Caitlyn said Sue was boring). Caitlyn first declared we should get a girl baby, a sister, but then decided we should get a baby and a sister (mama stopped that thought).